With the silver price today up 0.7% to $17.06 – its highest level since May 22, 2015 – it's safe to say silver prices are on fire again. The price of silver has rallied 23% so far this year. That comes following a 72% drop from its 2011 peak of $49. Last week's silver price performance was impressive. For the second week in a row, it continued to outperform gold prices. Although gold is viewed as the best safe-haven investment, silver is arguably the next best thing despite its smaller market and higher volatility. And now more and more investors are coming to that same conclusion lately. While there are a few indicators of silver price drawbacks in the near term, it seems the price has a lot of room to run in the medium to long term. After trading flat on Monday, April 18, silver prices popped 4.4% on Tuesday to close at $16.92. This surge was due to weakness in the U.S. Dollar Index (DXY), which fell to 94.12 near the bottom of its 52-week trading range. 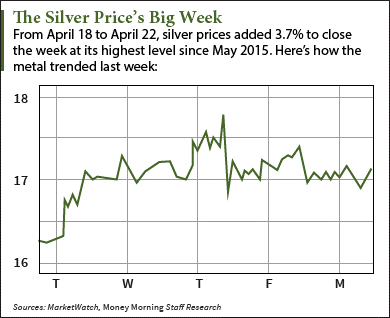 On Wednesday, April 20, the price of silver jumped higher alongside the price of gold. But after the silver price opened above $17, it couldn't hold those gains and settled lower at $16.94. Similar action happened during the following session. After rocketing above $17.60, silver prices were unable to hold those gains and closed at $16.97 for a 0.2% gain. Friday was a rare session as silver moved opposite gold in early morning trading. But both were in the red by the end of the day as the gold price fell 1.6% and the silver price dropped 1.1%. After closing at a one-year high of $16.95, silver prices posted a weekly gain of 3.7%. Last week, I told you about how the gold/silver ratio had likely peaked recently at 83 before dropping to 76. Well, that trend continued through this past trading week as well, with the ratio now standing at 72. That means silver prices have continued to gain relative to gold prices – something I expected given the extreme high in the ratio at 83. However, there are some indicators showing how the price of silver may come under pressure soon. According to the recent Commitment of Traders (COT) report, we see the commercial traders – considered to be the "smart money" – are near a four-year extreme short position. That doesn't bode well for silver prices in the very near term. Another technical indicator is the large negative price reversal recently. On Thursday, April 21, the silver price had rallied over 2% during the day but dramatically reversed and closed in the negative. 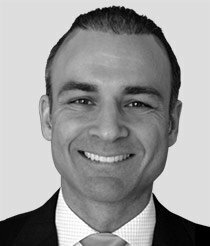 According to Jason Goepfert, an analyst for Sentimentrader.com research service, "Prior times, when it suffered a large reversal when smart money traders were betting against it, it tended to follow through on the downside, but it was extremely volatile (even more than usual)." We could be in for some weakness in the silver price, but that's likely to be somewhat counterbalanced by the improving gold/silver ratio. Stay updated on the silver price today. Follow us on Twitter and like us on Facebook. Gold and silver will be gaining on all fronts as the QE train is being continued (after FED, BOJ and ECB) – the war on cash will send gold up and up.